To tackle complex talent-related challenges, today and in the future, organizations will have to build high-performance flexible work cultures. That means boards have to educate themselves about why a flexible work strategy matters to people and the bottom line; step in and push management to embrace a culture-based approach to flexible work; and rein executives in when they are about to make ill-informed moves related to work flexibility. Unfortunately, many directors are not as involved as they need to be to drive broad flexible work culture change as a strategic imperative requiring line leadership focus and resources, in part because some don’t understand exactly what it is or how it impacts talent and business performance. They incorrectly think it’s an HR policy or program not requiring their time and attention. It’s why organizations — including IBM and Yahoo!, recently bought by Verizon — make unforced errors when they think flexibility is a benefit or policy they can simply cancel. There are innovative, forward-thinking public company line leaders who have transformed the cultures of their teams, departments and divisions through flexible work. But effective enterprise-wide scaling in public companies will require greater board involvement to prioritize the resources required for effective culture change. And to transfer the primary ownership of flexibility into the business where it belongs and out of HR where flexible work cultures too often struggle to get traction. For example, one of the principles of a high performance flexible work culture is “recalibrate as realities change.” That means when business realties shift, flexible ways of working should also adapt which isn’t possible within the traditional one-size-fits-all, all-or-nothing policy-based approach. The “ability to work flexibly” consistently ranks at the top of employment surveys. In fact, if a recruit is presented with an offer of more money and one with greater work flexibility, they will often choose the later. In other words, a flexible work culture gives people what they value most but ensures it also benefits the business. Strategic flexibility in how, when and where work is done also expands access to talent beyond the constraints of geographic proximity and traditional recruitment sources. By supporting remote work, it becomes possible to hire a person who lives too far to commute to an office every day. The need to improve gender diversity in the leadership pipeline is a priority for many businesses. To achieve this goal, well-intentioned employers will position work flexibility as part of their “women’s initiative” assuming women and mothers are the ones who need it the most. Ironically, this does two things. First, it reinforces the career penalty women report they experience when they work flexibly, which actually undermines advancement. Secondly, it ignores reality. According to a survey of a probability sample of full-time U.S. workers we recently conducted in partnership with ORC International, men are just as likely as women to say they have some degree of work flexibility and they are more likely than women to say they do most of their work from a remote location. Specifically of remote workers, 59% are men. When organizations recognize this gender-neutral reality and position work flexibility as culture-based strategy for all employees, they remove the career penalty and provide both women and men with the support they need to succeed. A flexible work culture can also make it easier to supervise and integrate the on-demand consulting talent hired to take on non-core or project-based responsibilities. They become part of a cohesive flexible work team with full-time staff who are also working flexibly, which makes everyone more effective. A common roadblock that keeps senior leaders, and perhaps directors, from building a flexible work culture is the fear it will undermine productivity and team collaboration. Actually, our research and experience show just the opposite will occur. If work flexibility is implemented correctly with the appropriate training and guidance, it can lead to gains in productivity, engagement, team communication, creativity and innovation. The reality is if you give good people the skills and tools to flexibly do their jobs how, when and where they are most productive and effective, they will give you more effort and commitment in return. Almost no one will give you less. Those few that do typically have performance problems usually have nothing to do with flexibility and should be dealt with accordingly. 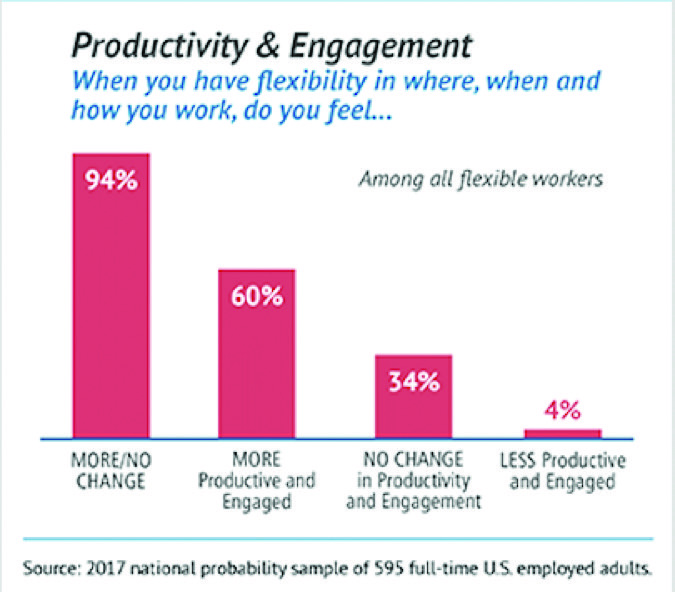 In our new national survey, we asked, “When you have flexibility in where, when and how you work, do you feel…?”, 60% of flexible workers say they are more productive and engaged. Then we asked, “When you have flexibility in where, when and how you work, do you feel your ability to communicate, create and innovate with colleagues…” 45% of flexible workers report their ability increases. Bottom line: The same strategy that attracts and retains a diverse, flexible workforce can also help those same people perform better and smarter, day to day, on the job. Boards may want to consider encouraging senior leadership to conduct a baseline assessment. The key question: Where is your organization with regard to work flexibility today, what more is possible and what steps will close the gap between that current and future state? According to our research, chances are the foundational elements of a flexible work culture already exist to some degree. The question is how does the business provide the beliefs, skills and tools that take this initial success to the next level of strategic implementation? An informed board that challenges and pays attention can ensure their organizations are positioned to get ahead of and benefit from a flexible work culture transformation. Cali Williams Yost is founder & CEO of the Flex+Strategy Group, a consulting firm focused on creating flexible work cultures that achieve high performance and well-being.